Learn how the Lakota lived. Experience the Lakota language. Improve math skills. In Making Camp Lakota, players practice multiplication and division skills. They’ll also be introduced to Lakota history and culture. Earn points by solving math problems and answering social studies questions in the village-building simulation game as you earn items to customize your tipi. 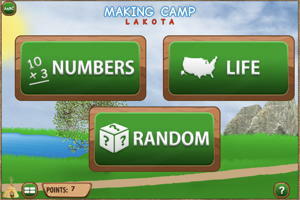 Created with the Thunder Valley Community Development Corp., Making Camp Lakota is the the FIRST fully English/Lakota bilingual, cross-curricular math video game. Language of instruction is controlled by the player on every screen within the game, including text, audio and video content. It can be played in English, Lakota or flipping between the two. It is the second bilingual game in our Making Camp series. Whether you are a Lakota speaker, a Lakota language learner or hearing Lakota for the very first time, Making Camp Lakota has something for you! Or get it on the app store (free there, too). Requires download? App version only.